The year 2015 will show up as every year the newest jewels of manufacturers. Samsung, after 2014 particularly difficult because of disastrous sales of Galaxy S5, will be keen to show its expertise in 2015. On March 1, the Korean hold a special event during which he will officially present the Galaxy S6 and dual edge variant. 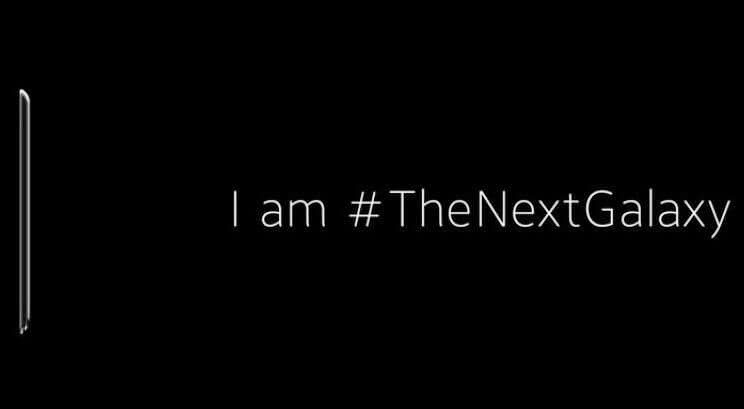 But like every year, well before an official announcement, rumors tributary on the web and give us clues about what might look like the long-awaited smartphone. The Galaxy S6 is no exception to the rule, rather the contrary. To see more clearly so here is a full review of what we know about the Samsung Galaxy S6! Samsung seems he turned the corner of the metal to the image of the Galaxy Alpha and the next Galaxy S6 should also be made ​​of this material, to the delight of fans waiting this long. Note that the unit would decline in four colors. No black model, but four dark blue variations, gold, turquoise and white. Given the latest devices released by the Korean like Galaxy A range, as evidenced by various reports, the S6 should be equipped with a metal shell. 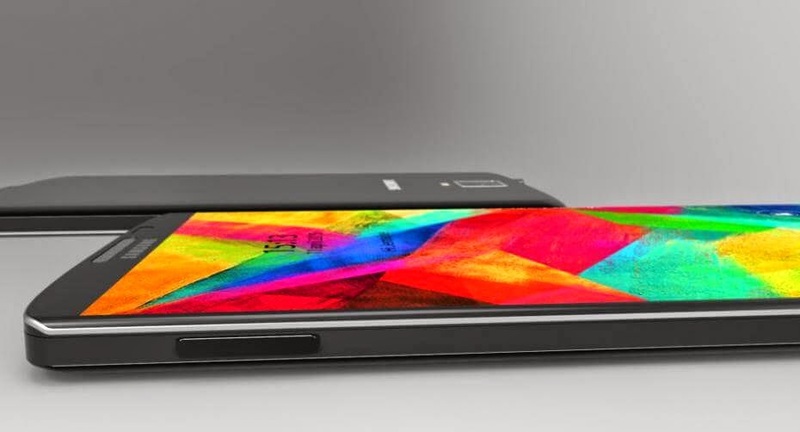 There is even talk of a design combining glass and metal similar to what Sony offers with the Xperia Z . By cons, we must keep in mind that this type of design would be to the detriment of a removable battery. 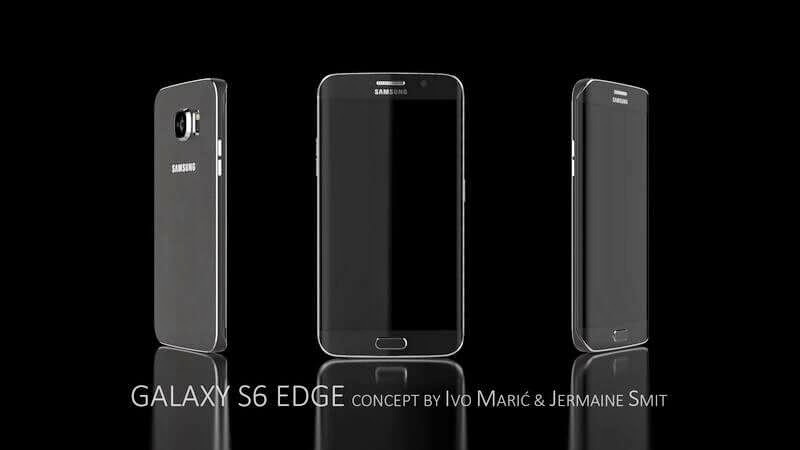 To believe the latest official teaser posted by Samsung, the Galaxy S6 will, indeed metal. A change long overdue from the Galaxy users. By offering a new generation of its flagship smartphone, Samsung could also see its storage capacity rising, by proposing two storage options of 64 and 128 GB. Unfortunately, this is not necessarily good news since, because of its unibody design, it may well be that the device is free from SD slot. Furthermore, the increase of the storage capacity may also cause an increase in the sales price. Samsung would have decided to keep the same screen size as the one adopted for its Galaxy S5 , last year. A choice that should delight users who complain about the continual increase in the screen size of smartphones. This screen should be covered with the glass strongest protection of the market, Gorilla Glass 4, we already found on the Galaxy Alpha and Galaxy Note 4. The Super AMOLED technology will undoubtedly be further improved in order to always offer more accurately and more realistic colors. 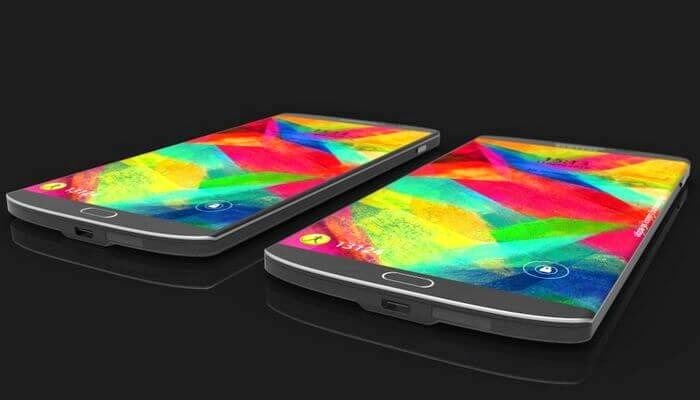 Like the Note 4, Galaxy S6 should be entitled to its curved variant. The originality of this alternative would be that the screen, similar to that of the Galaxy Note Edge is curved, not just the right but in the two groups. Information confirmed by Bloomberg and original technology we unfortunately do not know the benefits. Who says high-end product says latest components. Galaxy S6 should not escape the rule. According to recent rumors, the next Samsung flagship is equipped with a Exynos processor is home last cry supported by 3 GB of Ram. The track of 810 Snapdragon Qualcomm would have been ruled out. In return, the unit will equip a 7 Exynos Octa processor including Samsung announced the start of mass production, there a few days. Engraved in 14 nanometers, it would be able to offer 20% more performance and especially reduced energy consumption by 30 to 35%, compared to a processor engraved in 20 nanometers. Korean version of the machine and its variant Edge have already been spotted several times on the benchmark tool AnTuTu and on Geekbench, with an octo-core 64-bit processor Exynos 7420. This is, in reality, of the reference of the Exynos Octa 7. 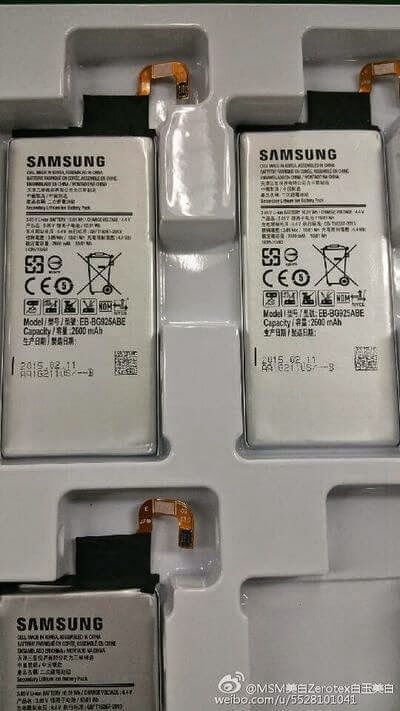 If the Galaxy S5 proposed a 2800 mAh battery, the Galaxy S6 should be limited to 2600 mAh, as stated in the latest reports on the subject. A decision primarily for aesthetic reasons, the device is supposed to provide a thickness of 7 mm. Nevertheless, it would issue the S6 offers better battery life than its predecessor thanks to its latest processor engraved in 14 nanometers. In addition, according to the latest release from Samsung, the battery would be natively compatible with wireless charging, the Korean technology seems determined to democratize with its next generation of smartphones. No need to buy a specific replacement shell to make compatible device, which would, in any case impossible with a unibody design. With its next high-end, Samsung plans to make two major improvements to the user board overlay, TouchWiz. The new version would be lighter and devoid of lag that has often criticized. 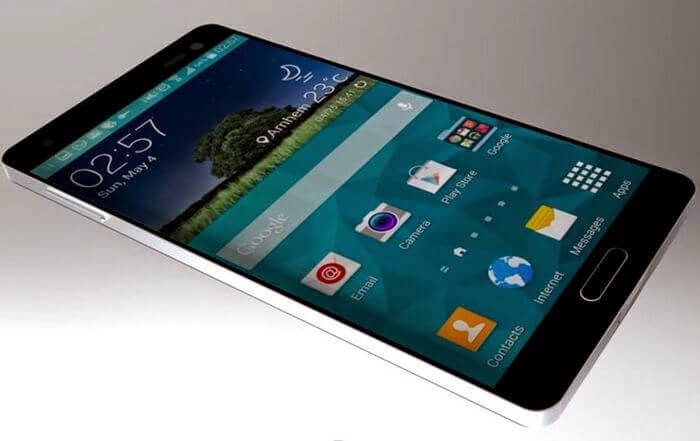 Samsung would provide even to mimic the interface of the Nexus 6 for clarity . All native applications from Samsung, originally preinstalled on devices disappear and be available for download only, leaving the choice to the user to install them or not. However, the overcoat integrate various applications such as Microsoft OneNote, OneDrive, Office Mobile or Skype. The software is optimized for 64-bit processors so as to provide better performance. But that's not all because the new UI should also introduce more customization via the Theme Center that will change the appearance of the smartphone. It will also download additional themes from the Theme Store. The year 2015 will be the year of the photographic revolution as Sony and Apple. Samsung should definitely get a place in this race the best sensors. Some sources suggest that Samsung would choose to keep the same Sony IMX240 sensor than the Galaxy Note 4. Others argue that to get a place among the best, Korean consider equipping its Galaxy S6 with a rear camera 20 megapixels. At the front, we should find a 5 megapixel camera. Today, it seems that after having tested both models, Samsung has decided to bring its choice to the Sony IMX240 image sensor 16 megapixels, which has already been proven with the Galaxy Note 4. However, the Korean has decided to bring him various improvements. The first official teaser suggests that they may relate its low-light performance. Anyway, Samsung has promised that his next phone would revolutionize the photo on smartphone. As you may know, each year Samsung unveils new features that some call "gadgets". The Galaxy S6 should not escape the tradition and obviously talking about an improved fingerprint sensor, UV sensor or an iris scanner. For the latter, we remain skeptical because even if the technology exists, unlock your smartphone through this method would take forever. In terms of usage there better. The most likely track and half confirmed by our colleagues would SamMobile a fingerprint sensor improved the like than the last iPhone. Like the iPhone 6 and 6 Plus, S6 inaugurate a mobile payment system called Samsung Pay. However, unlike Apple technology that requires compatible NFC payment terminals to operate, one developed by LoopPay is compatible with virtually all payment terminals. The recent acquisition of the US company by the Korean giant has credence to this hypothesis. Contrary to rumors that ran far, the Galaxy S6 is not waterproof like its predecessor the Galaxy S5. The firm would actually look back and would use the same technique as for the Galaxy S4 leaving an Active Galaxy S6 version that will be the only one with the waterproof standard. Finally, the SAR (specific absorption rate) would be extremely low and only 0.306 watts per kilogram. Which is 1.3 W / kg less than the legal limit. This is always a plus for the health of the user. The Galaxy S6 will be formalized at MWC Barcelona on 1 March as part of an event that will take place the day before the official opening of the exhibition. According to an internal document from Samsung, the run on the canvas, its release date is scheduled for the week of March 22. The Edge version could arrive a little later, around the 19th of April.